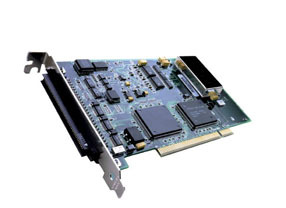 The OMB-DAQBOARD-2000 is a family of high performance analog and digital I/O boards for PCI based computers. The family includes multifunction boards, analog output boards and digital I/O boards. The OMB-DAQBOARD-2004 is an analog output board. It offers four 16-bit 100-kHz analog outputs. The analog outputs can range from . 10V to +10V. Through the use of Bus Mastering DMA, each D/A output can continuously output a waveform, which can be read from PC RAM or a file on the hard disk. In addition, a program can asynchronously output a value to either of the D/As for nonwaveform applications, presuming that the D/A is not already being used in the waveform output mode. Additional low-speed D/A channels can be added to the OMB-DAQBOARD-2004 through the use of the OMB-DBK2 analog output option card. When used to generate waveforms, the D/As can be clocked in several different modes. Each D/A can be separately selected to be clocked from one of the sources described below. Asynchronous internal clock. The onboard programmable clock can generate updates ranging from 1.5 Hz to 100 kHz, independent of any acquisition rate. Synchronous internal clock. The rate of analog output update can be synchronized to the acquisition rate derived from 100 kHz to once every 5.96 hours. Asynchronous external clock. A user-supplied external input clock can be used to pace the D/A, entirely independent of analog inputs. Synchronous external clock. A user-supplied external input clock can pace both the D/A and the analog input. Forty TTL-level digital I/O lines are included in the OMB-DAQBOARD-2004(P2). They are divided into three 8-bit ports and one 16-bit port(P3). The P2 ports can be programmed in 8-bit groups as either input or output. The 16-bit P3 port can be programmed as all inputs or all outputs. Ports programmed as inputs can be part of the scan group and scanned along with other analog and digital input channels, or can be asynchronously accessed via the PC at any time, including when a scanned acquisition is occurring. In addition, the P2 ports can be expanded up to 256 digital I/O lines using external OMB-DBK digital options. These options are available as TTL-level I/O, relay output, or optically isolated input and output. Whenever expansion digital I/O is attached to the OMB-DAQBOARD-2000 series, the P2 I/O lines are no longer user-programmable, and are instead used to communicate with the digital expansion options. Four 16-bit counters are built into the OM-DAQBOARD-2004, each capable of counting up to 65,536 TTL-level transitions. Each of the four counters will accept frequency inputs up to 10 MHz. The counters can also be cascaded, allowing over four billion counts to be accumulated. Software support is extensive, including comprehensive drivers and new ActiveX/COM-based programming tools for nearly every programming environment under Windows 95 and higher. Included in this list are Visual Basic, C++, Delphi, TestPoint, LabVIEW, and DASYLab, and C++ for Linux. Also available is a suite of DaqView software options for setup, acquisition, display, and analysis of acquired data. no programming required. Analog output board, four 16-bit D/A converters, 40 digital I/O and counter/timers. 100-conductor expansion cable, 3 ft.
참고: All OMB-DAQBOARD-2000s include a CD ROM with all documentation including operator’s manual, DAQX API library for Windows 95/98/2000/ME/NT for C++, Visual Basic and Delphi and drivers for LabView, TestPoint and DasyLab.